In addition to pages of puzzles and other brain teasers, there's a quiz tailored to their team. What are football fans doing when they're not watching football? Thinking about watching football, of course. Entertain them between games (a whole week!) and seasons (an eternity!) with this personalized quiz book. Your #1 fan's name is embossed on the cover and printed inside with an optional message from you. 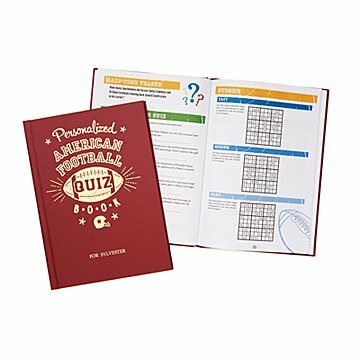 In addition to pages of puzzles, questions, fun facts, and other brain teasers about football in general, the book also includes one quiz tailored specifically to their team, making it a great gift for the person in your life who has their own touchdown dance. Made in the UK, where their version of football has no touchdown dances (or touchdowns). I purchase this book for my fiance, he love sports. He is a man that has everything so it was a little difficult trying to find him a gift. But he love this one! Very poor quality, missing team quiz, a thin tome. Could not give as a gift. This is an excellent gift for any football lover & the personalization was a wonderful bonus. My husband loved his anniversary gift!